Tip of the hat to ML contributor Brian who sent the above photo alerting us that there’s a cart called Swirl at Front & Pine selling frozen yogurt, and currently giving out free samples. Based on the cart’s signage it looks like their thing is to not just throw the toppings on the frozen yogurt like they do at Red Mango or all of those pink YoGo trucks you see everywhere, but instead it’s swirled into the actual yogurt from whatever you choose at the mix-in bar. Hopefully the prices are also a little more gentle than at the chain places. 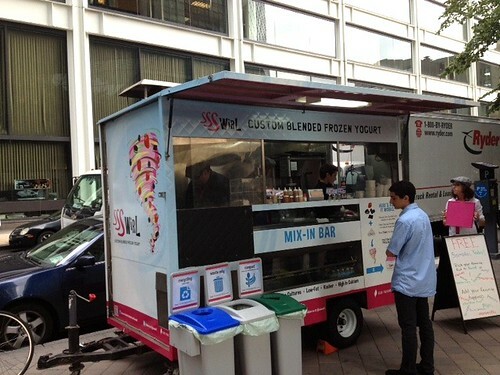 Posted by Andrea H at 11:56 am, August 1st, 2012 under Financial District, Sweets, Swirl Cart.